Today’s announcement continues to broaden American engagement in Burma, including increased opportunities for trade and investment, development assistance to strengthen the capacity of the government and people to promote growth and opportunity, and principled support for political reform and national reconciliation. Americans will continue to stand with the government and people of Burma as they continue their democratic transition, and work to realize the full promise of their extraordinary country. This is good news for Burma ... but with one exception. The same executive order reinstated the restrictions on the importation into the United States of "jadeite and rubies mined or extracted from Burma, and on articles of jewelry containing them." Why is the U.S. fully engaging with Burma, and encouraging American investment in the country, but still restricting trade in ruby and jadeite? According to a statement from the White House, "the Administration is maintaining restrictions on specific activities and actors that contribute to human rights abuses or undermine Burma’s democratic reform process." The American government is apparently concerned that gemstone mining is under control of the Burmese army. The jadeite and ruby mines are located mainly in Kachin state in northern Burma, where the army has fought a civil war against the Kachin Independence Army. But it would be wrong to think that the proceeds from gemstones are funding this conflict. The Burmese goverment has been fighting insurgencies from ethnic minorities such as the Wa, Karen and Kachin since independence in 1948, with periodic ceasefires and treaties. It is up to the Burmese government to find solutions to these internal conflicts. International sanctions have had little effect and in fact there is reason to think that the sanctions on ruby and jadeite may be counterproductive. Burma has no shortage of customers for its ruby and jade, especially in China, and indeed the sales numbers from the June 2013 Myanmar Gems Emporium auction set a new record of USD $2.4 billion. The reason that the American sanctions may be counterproductive is that the U.S. now has no influence on Burmese gem mining. There are indications that the Burmese military is rushing to exploit the ruby and jadeite deposits, bringing in heavy machinery to replace artisanal mining. This has 2 bad effects: it displaces human labor and it it means the gem resources will be exhausted much sooner. Both are bad for Burma. It seems like the military sees the writing on the wall -- there will be full democratic elections in 2015 and the generals may lose much of their political power. The U.S. is now the last country in the world to maintain sanctions on Burmese ruby and jadeite -- the European Union, Australia and Canada have all lifted sanctions. Indeed, for some reason the Americans seem to be getting more serious about enforcement of the ban, which are been in place since 2003. A U.S. government department known as OFAC (Office of Foreign Assets Control) has recently exerted pressure on PayPal to refuse transactions for Burmese gems, even when the gems are sold to customers in countries where it is perfectly legal to sell them (Burmese ruby and jadeite imported to the U.S. prior to the ban may also be legally sold). We fail to see how these draconian measures are advancing the development of political and economic reform in Burma. This month we feature new acquisitions, including a superb large Ceylon sapphire, a stunning star ruby from Mozambique, and a vivid mint garnet from East Africa. 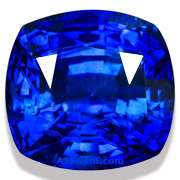 An exquisite royal blue sapphire in a very large size! This fine Ceylon sapphire displays a vivid blue under all types of lighting. Beautifully fashioned in a square cushion cut, this fine gem displays full fire and excellent luster. Two carats larger than the Princess Diana sapphire, and with a sweeter color, this is a gem fit for royalty. Certified as natural by GemResearch Swisslab (GRS), with color noted as "vivid blue" (GRS type "royal blue") and origin noted as "Sri Lanka." An exceptionally fine star ruby from Mozambique. Top color and clarity, with wondeful translucency. The star is clear and sharp and well centered. 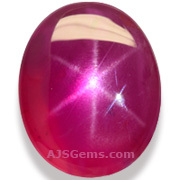 Star rubies of this quality are extremely rare ... this is a gem for the serious collector. Certified as completely natural and unheated by GemResearch Swisslab (GRS). 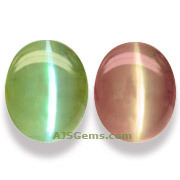 A rare Alexandrite Cat'e Eye with a strong color change and a very distinct cat's eye. Over 5 carats, this exceptional gem has been certified as natural and untreated Alexandrite by GemResearch Swisslab (GRS), with the color change noted as yellowish-green to purplish-red. A rare gem indeed. We have just acquired 3 large rhodolites from Madagascar, all over 15 carats and all beautiful crystal. The largest is the 20.73 ct pear shape shown here; we also have a 16.93 ct oval and a 16.18 ct pear. These are all loupe clean gems with fine color, completely untreated. 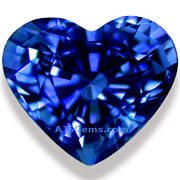 A stunning blue sapphire heart that is full of life. Cut with care and precision, this well-proportioned heart has excellent sparkle and fire. Exceptionally clean and bright, the color is as sweet a blue as you could hope to find. It will set up to make a fine piece of jewelry. 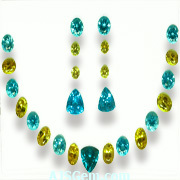 Guaranteed natural by AJS Gems, Bangkok. We have just added a new section to our website, featuring gemstone suites created by our designers. These range from earring sets to necklace layouts, with many featuring creative combinations of gem varieties, colors and shapes. All have been carefully matched up by our staff. 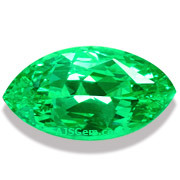 They range from inexpensive semi precious sets to fine spinel and tsavorite and spessartite garnet. We now have more than 65 suites displayed and will add more shortly. With the decline in gold prices, the world demand for gold jewelry has increased 37% in the last year, according to a World Gold Council report This is the largest increase in five years. Though demand was up in all markets, the strongest demand was from China, India, the Middle East, and Turkey. Lower gold prices are good for both the gem & jewelry industry and the consumer (though not gold miners). It really depends on the type of gem. If you have a valuable sapphire or ruby, for example and want it be sure it is natural and untreated, or want an opinion on its origin, it would be wise to send it to one of the leading gemological labs, such as GIA, GRS, AGL or Gubelin. These labs have the sophisticated equipment to detect advanced treatments, such as lattice diffusion. Inexpensive stones are usually not worth the cost of lab testing. Buying from a reputable dealer is your best guarantee of getting a high quality natural gem.